Wow… did anyone else notice Kyle’s response to the fact that Dawn and her family can’t afford food? Right, yeah, like they’ve got a choice about it. Fucktard. And what’s with the plug for his website? Sexmaking. Speaks for itself, really. Brilliant. I did notice BritishHobo. And a more appropriate response would have been to offer FOOD. The Church must have something better to offer than a podcast. Ahahaha on the last one! Sort of a Catholic? I think Kyle might have words to say about that! As usual Father Sha FTW!! Yep. Guilty as charged. I have girl bits. Don’t want to make you cry though. knobjockey, Bet he’ll ponder that for a bit huh? Considering he believes the world was made 5 thousand years ago, I think trying to get to grips with that fact will make his head explode. Haha if he did, that’s what’s known as Darwinian selection. Let’s hope it happens sooner rather than later. Maybe we could get the ball rolling by posting something along those lines now gingivitis? Oh, and damn you lamebook for taking down my links. I believe the “Pastor” here is an imposter. Lamebook is always best when the subjects find out they’ve been lamebooked and flood the comments section with even more lameness and arguing. Kind of like in championship wrestling when the wrestlers spill into the audience and start beating people up. Speaking of which, where did “Jason’s Monster Fail” go? Are you guys serious? I don’t understand why it is such a big deal for people to talk about their faith openly. For Kyle, I’m sure he had good intentions, but “advertising” was the wrong way to go. Fasting, at least as Catholics believe, really does help. If this was about Muslims or something I wonder if everyone would make fun of them. I am getting so sick of everyone making fun of Catholics. For the pastor, yes many Protestant pastors are not educated, but that does not mean that they aren’t good at what they do. Simply because he can’t spell doesn’t mean he can’t lead people to God. And for the record, Valentine’s Day is a Catholic saint’s feast day. Look it up. “kind of a cathlic” – at least he’s honest. If he is on the fence, at least he can say so. It’s ok, I cry all the time, don’t worry about it. @ jinkies: nobody said he can’t spell. He’s Nigerian, and their form of writing is a lot more phonetic than ours. The reason we’re going on about him is cos I knew who it was and saw that post before it was up on lamebook, and showed the original. You’re the only one who said he can’t spell. And, in fact, he has led me to god. hey just throwin this out there, fasting can be from anything. you don’t necessarily have to fast food. you can fast from facebook or tv or long walks in the park. it’s about sacrificing something you enjoy and spending the time you would normally spend doing that praying or something. i think you guys all looked at kyle’s reply wrong. he was just offering something that helped him through his hard times. they obviously don’t live close together so sending food isn’t exactly practical. it’s the same as sending your dinner to those starving kids in africa that parents are always talking about. The reason you see Catholics generally made fun of rather than Mormons or Buddists or Islams is because Catholics are the greediest, most self-absorbed, and most likely to preach to those of other or “wrong” religions religious people out there. why on earth is dawn on the internet if she cant afford bills??? this just doesn’t make any sense-idiot! And if she might be pregnant that is just shows what an idiot she is because you do get free condoms (ok not nice…)but you do get! 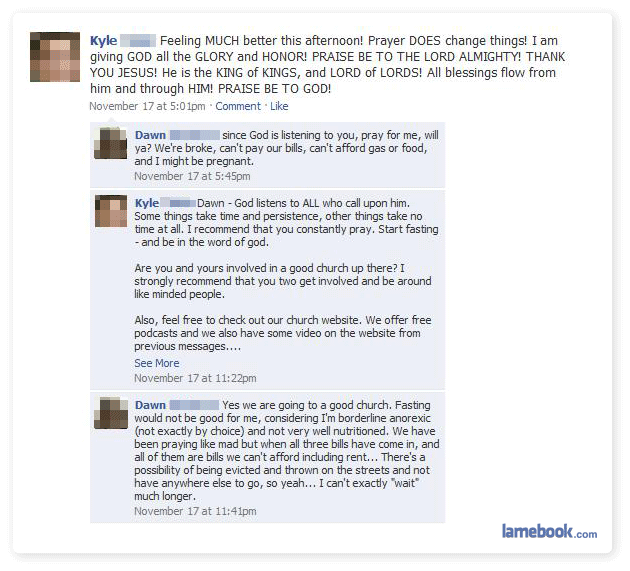 Kyle is just one of those annoying bible bashers….erg those type of people drive me up the wall! I don’t hate Catholics, but I don’t think ‘Pastor’ is Catholic, I think he is just a loon. Jinkies, I am ex-Catholic: I only go to church on Christmas eve and Holy Saturday. The candles make it all pretty and I get to have the best sleep. That being said, I do and will always make fun of Catholics. Half of the views are archaic esp. if you know half the crap they do to brainwash people in Africa and Asia. How many American Catholics go to church with dresses and scarves on? Yet in Africa, they’re told that to wear pants/trousers to church and not wearing scarves(women) will put them on a straight path to hell. How many so called Catholics are divorced in the USA? In Africa, they’re taught to believe that leaving your husband(NEVER THE WIFE) is a sin. The Catholic church is still very partriachial and until they fix some of their so called dogma, I’ll keep making fun of them because I’m also making fun of my family. Everybody knows that God/Jesus likes to barter. Offer up an ulcer and he grants your every wish! @Lady Katara and bollywood_rocks83: Unfortunately, you two are correct, there are many evil and corrupt Catholics. The Catholic Church itself has had many evil people in it, including popes of the past. That being said though, Jesus welcomed sinners. Also, many that the Church has, God does not have and many that God has, the Church does not have. I am not trying to say that Catholics are the best or that everyone is wrong in their beliefs if they are not Catholic. Even the Church does not say that. In fact, it is explicitly stated in Vatican II’s Lumen Gentium that there is salvation outside the church. Also, bollywood_rocks83: Cannot all of the Christian denominations be traced back to Peter, since they broke off from the Catholic Church? I know that the Catholic Church is the one that acknowledges Petrine Ministry and the Holy See, but I don’t think that Catholics say that it is the only denomination traced back to Peter. True, educated Catholics (not the kind that will chastise others) know that we are in the midst of the ecumenical movement and are trying to unite all denominations at least in terms of what we agree on. This is also a document found in Vatican II. I’m with jinkies. I don’t care what people spout on FB – it’s their choice to say what they want to say. Personally, I think the people who advertize their STDs are dumber and more annoying than people who are religious. At least religious people don’t (in most cases) intend any harm, and only want good for others, and aren’t hoey slutbags tramping their cooch all over the internet because they think they’re the first people ever to be this hot. Maybe it all has to do with who you’ve met in life. People who’ve been around douchebaggy religious people are of course going to hate religion. But for the record, there are religious people who are awesome. I don’t think this has been pointed out yet, but Dawn could be accessing the internet from, you know, not her own computer. So most everyone seems to be against Kyle spouting his religion. What about you spouting your non-religion? Seems kinda hypocritical to me. @shooblie It had been pointed out. It’s also been pointed out that she accessed Facebook at both 5:45pm and 11:41pm. How do you propose she was getting online? Um. Who said Kyle was Catholic. While we’re on the subject of bashing religions, why not consider Scientology. Maybe he’s a snake tamer. I don’t know about everyone else, but I’ve never been to a church that offered podcasts. This guy isn’t Catholic. Baptist maybe, but not Catholic. Regardless, he’s a douche. Then again, so is Dawn. Pastor – BAAAHAHAHAHAHAHAHAHAHAHAHA. I laughed so hard I peed a little. I know several people who hail from Nigeria. This isn’t how they write or speak. I don’t think we can justify his written language based on the fact that he’s from Nigeria. I doubt his English textbooks spelled four with ‘4’. Perhaps Nigerians speak like this, but speaking and writing are two different things. Prayer: works so much better than actually doing something.